Lac Court Oreilles is a large spring-fed lake of over 5,000 acres. It is the largest lake in the county and known for excellent fishing, sailing, exploring and water sports. This newer lake home comes with a sandy beach and 48 foot private dock. Truly the Northwoods Vacation of your dreams. I was raised on a lake not to fare from this one in North Central Wisconsin and now I'm living in South Central Wisconsin. I'm an avid outdoors-men as well as a family man with 3 kids that are into everything. My wife and I bought this house to use as a personal get away but as most people with active kids there just isn't to many weekends a year when we can get away so my loss is your gain. We thought we would open it up to let other families enjoy it when we can't. We looked at a lot of cabins and not to many met our requirements- we wanted a place to bring friends and our kids friends and be able to spread out so two separate sitting areas where a must, we wanted a relatively flat lot with out a bunch of stairs to the dock (Very hard to find in the Hayward area), we wanted a bigger lake with crystal clear water and we wanted a cabin that felt like you where "Up North" and this place has it all and then some. I would love to spend every day here if I could. The views are incredible and the lake is great. Come see for yourself why we chose the Majestic Retreat. It truly lives up to it's name. This cabin has it all for family and friend get togethers, two large sitting areas, large dining area, large decks, lots of yard, a nice sandy beach and a private pier for your boat. The views are amazing and floor to ceiling windows let in tons of light. When I walk in the door my troubles melt away. Come see for yourself. The fishing is pretty good too. Excellent views of the beach and lake from most of the rooms in the house and the large front deck. 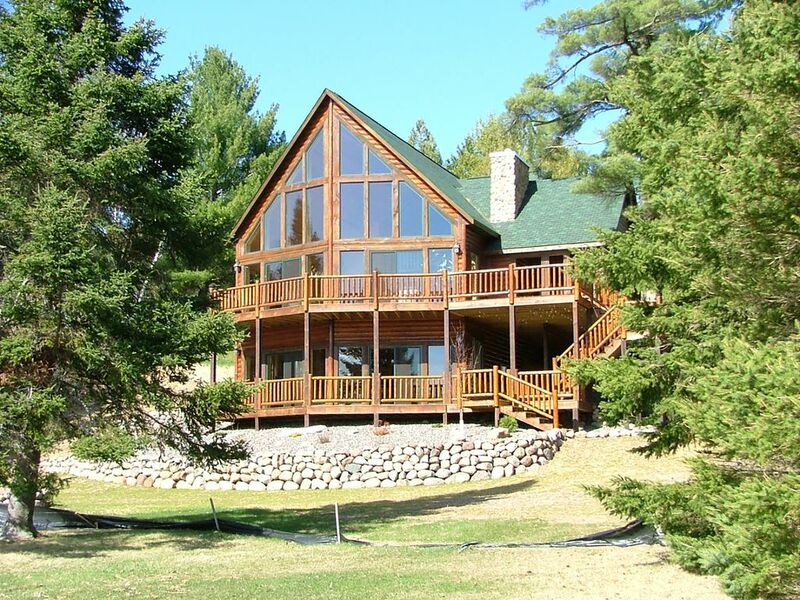 Lac Courte Oreiles Lake is one of Hayward's nicest lakes and this cabin is right on it. Two stone fireplaces- one in main living room and one in the game room. Full kitchen including pots and pans, tableware etc. All you need to cook meals at the house is available. Table seats 8 adults with 4 additional seats at the kitchen island. 45 Inch TV with Dish Network in Master Suite, 50" TV with DVD and Dish Network on main level, 50" TV with Dish & DVD on lower level, small tv with DVD in the bunk bed room on lower level. Small aluminum boat with oars included with rental. Some life jackets available. Please consider bringing your own. Pontoon and power boat rental available on the lake. 10 minute ride to Hawyard with all sorts of activities and a huge clear lake to swim, fish and relax by. Just got home from a weekend spent here. We had a party of 10 and it was the perfect place for a get together. More than enough space to hangout and cook. Location was absolutely beautiful and can only imagine how much more amazing it would be in the summer and fall! We will be back soon! Hi Cheng, Thanks again for staying with us and for the great review. We would love to have you back at any time. The fall colors are amazing from this cabin with the floor to ceiling windows. I'm so glad you enjoyed your stay with us. If you like the Hayward area in March I'd encourage you to come back in the summer and experience life on the lake or for the fall colors in October. The cabin was clean, spacious, and well-equipped without being cluttered. Great view of the (frozen) lake. Jon was very responsive to inquiries and addressing questions. Hi Todd, Thanks so much for staying with us and for your patience with our battle to keep the roads clear during the "Great Birkie Blizzard" this year. We would love to have you and your group back anytime. 4 of us came up to musky fish for 4 nights. Everything was nice; kitchen, bedrooms, bath and showers. Easy access to Hayward yet quiet and private. We wondered why towels were not provided, given the high quality of the home. Hi Steve, Thanks for staying with us and for the great review. I'm glad to hear you had a good stay. Did you catch any nice Musky? In regards to your question on towels, as we have mentioned in most of our "what to bring" correspondence- we don't provide them at this time. Let me explain- towels have been a real challenge for us as many of them disappear or end up in the lake and in addition, with such a large home and no commercial laundry in the area it's hard to get them cleaned and back in the home for same day check-in of new guests during the summer. We do offer a washer and dryer on site so you don't have to bring as many towels. Most of the lake homes in our area don't provide towels either for the same reasons mentioned above. I wish we had a better solution here but unless a commercial laundry is built nearby we just don't have a good option short of asking guests to bring them along. Having guests bring their own also helps us keep the costs of cleaning lower as we don't have to account for cleaning 12 sets of towels each guest. Again, thanks for staying with us and please come back again soon. The Ice fishing is also really good on LCO. This is the second time we've rented this cabin. it has great space for a family. Very clean with great outdoor space. We have been lucky that the shared beach hasn't been used by the other cabins so we had even more room for ourselves. Wonderful home and accommodations. Very clean and comfortable. A little disappointed in swimming area as there was a lot of debris in the water, made walking out deep difficult. But everything else was great! Spectacular view. Definitely would recommend it. I'm sorry the beach area wasn't to your expectations. We check it regularly between guests and remove derbies etc. Unfrotanitally storms can blow things in and out from day to day. Will definetally check it out again today. About Our Lake- Lac Courte Oreilles (pronounced Couderay), 8th largest natural lake in Wisconsin. Its waters are spring-fed and crystal clear with a maximum depth of 90 feet and 27 miles of beautiful shoreline. Lac Courte Oreilles offers a complete variety of fishing, which appeals to the best and youngest of anglers. It’s history-proven on its musky productions with a 50” size minimum and is abundant with walleye, northern, bass and panfish. Motor trolling is allowed. Lac Courte Oreilles represents the ideal vacation lake . . . whether it’s fishing, boating, swimming, skiing, sailing, snorkeling or scuba diving! Last year this cabin booked up for the entire summer very quickly. Don't delay- book your family vacation today. Booking only full weeks from Saturday to Saturday during June, July and Aug.